Congratulations are in order for Airman First Class, Travis W. Hirst, of Methuen MA, for his successful completion and graduation of Basic Military Training with the United States Air Force, achieved on February 7th, 2019. 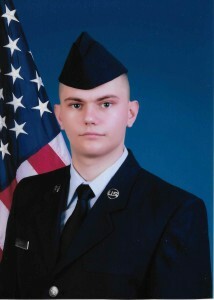 A1C Hirst trained with Flight 157 of the 323rd Training Squadron, at JBSA Lackland Air Force Base in San Antonio, TX. Congratulations are also in order for the entire Mustang Flight 157 for achieving Academic Excellence, earned only by the highest ranking Flight for their academic achievements throughout Basic Training. Congratulations, A1C Travis W. Hirst, on your noble achievement. Good luck with your journey and career with the US Air Force. Thank you for your dedication and your selfless service. Continue to Aim High, Fly, Fight, and Win! A1C Travis W. Hirst is a resident of Methuen, MA, along with his proud mother, Kelly M. Buco, his step-father Michael K. Buco, and his sister Isabella K. Buco. His father, Alexander P. Hirst, his step-mother Kell-ey, and two step-sisters, Jillian, and Ell-ie who is a fellow Airman, reside in Sandown, NH.